CORVALLIS — It's 10 a.m., and 25 students have convened on the second floor of the Agricultural and Life Sciences building on the Oregon State campus for a 50-minute class entitled "advanced molecular genetics." Mikayla Pivec is nestled in the third row of seats between a pair of young ladies to hear a lecture by Michael Freitag, a German-born professor who serves as grad program director for biochemistry and biophysics at the university. 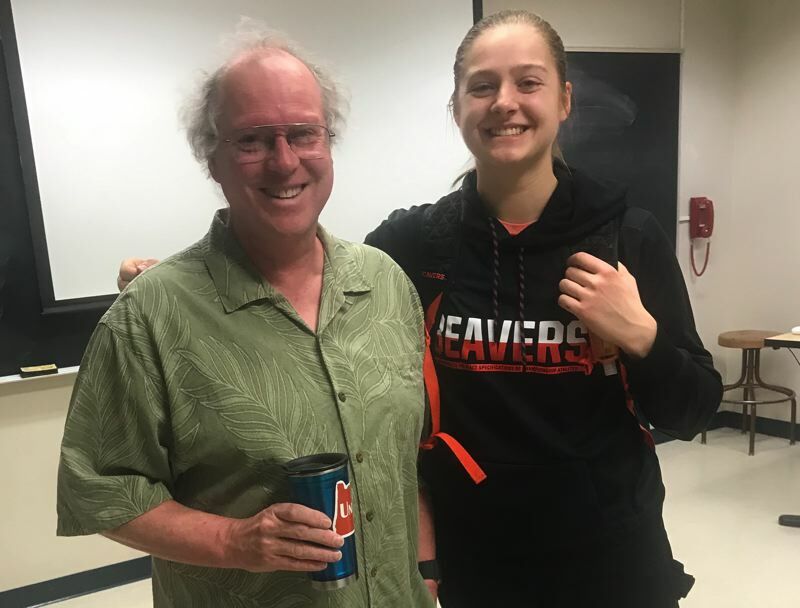 Pivec — star shooting guard for Oregon State's nationally ranked women's basketball team — has agreed to allow a reporter to observe the class and catch a glimpse of what being a serious student-athlete is all about. The subject matter for today's lesson is "RNA contact of cells." The vernacular is mostly well above the level typically understood by a visiting sportswriter, though the students in the class — many of them headed for a career in the medical field — seem to digest it without trouble. Freitag's lesson plan floats out words such as "eukaryotes ... ribosomes ... polymerase." A scribe's Scrabble acumen grows by leaps and bounds. One segment covers "RNA interference and siRNA-directed assembly of heterochromatin in fission yeast." This was likely not a class that football player Chad Johnson took during his short time at Oregon State. Pivec seems to be following along well. Most of the students go old-school and take notes on a notepad. Some bring laptops to take notes, but Pivec is the only one who has called up Freitag's lecture online. "I always bring the laptop so I can copy notes and follow along with the lecture," she explains. After class, Freitag — decked out in a button-down short-sleeved shirt, shorts, black socks and clogs on a semi-frigid morning — says Pivec is one of the first two students in a new biochem/biophysics grad program he is creating. Pivec, who turned 21 in November, is on target to graduate this spring in bio-health sciences after three years at OSU, thanks in part to some advanced-placement classes in high school. If things go as planned, she'll be able to complete her master's degree in biochem and biophysics in spring 2020. A 4.0-student who was named Lynnwood (Washington) High's "Student of the Year' as a senior in 2015-16, Pivec carries a 3.93 GPA as an undergrad at OSU. Last season, she was named to the Pac-12 All-Academic first team. "I have a B-plus and three A-minuses," she says. "The first A-minus I got, I was a little sad. But you do your best in your classes, study as much as you can, and then you have to be happy with the results. Can't be perfect." Mikayla's parents — Michael Pivec and Pam Paudler — "encouraged me from a young age to be a good student," she says. (Mikayla has one sibling, sister Malia, a sophomore at Boise State). "In middle school, I developed good study habits," Mikayla says. "If you put in the time on something, you can usually get good results. One of my goals is to do well in the classroom." Always, she says, "you have to have dedication to what you're doing." Pivec job-shadowed a pediatrician in Lynnwood last summer. "I really like working with kids," she says. "I could see myself being a pediatrician." That would come after, she hopes, a career playing professional basketball. Pivec is only the second student-athlete Freitag has had in 12 years of classes at OSU. Mikayla, he says, is a "top-notch" student. "I have high hopes for her," he says. "Not that many athletes go into a tough curriculum like this. She's doing pretty darn well to set up a career that doesn't involve balls." All of this is not news to OSU coach Scott Rueck, whose team is not just top 10 nationally on the basketball courts but probably on the academic side as well. Rueck has had many standout students in his program, notably center Ruth Hamblin (2013-16), an engineering major who earned Academic All-America acclaim. "I've had a lot of players who do a great job on the court, in the community and in the classroom," says Rueck, in his ninth season at the OSU helm. "Then there are the ones who take it to another level. 'Mik' is certainly one of those. She is unique. She is one of those special high achievers who raise the bar, within the locker room, within the gym, within the community." Pivec could have gotten her degree from Stanford. The Cardinal, who have reached the Final Four seven times since 2007-08, offered her a scholarship. When coach Tara VanDerveer called after Pivec's visit to Stanford, Pivec told her she was still deciding between Oregon State, Stanford and Washington. The next day, another recruit committed to Stanford, and Pivec's ride was off the table. Had the scholarship still been available, would it have been a difficult decision for Pivec? "It probably would have been a little more difficult, but I'm so glad I chose here," she says. "This is the right place for me. All the lessons I've learned, the roles I've had here in basketball — I wouldn't have been able to do at Stanford. Also, the people I've met, and the academic opportunities I've had here ... I'm not sure I could have had as good as an experience there, because I've enjoyed it so much here." Pivec arrived in Corvallis as the most decorated recruit at that point for Rueck at Oregon State; she was rated the No. 24 player in the nation by ESPN. She was a two-time state-of-Washington Gatorade Player of the Year and a two-time Seattle Times Washington prep female athlete of the year. Her signing was a pivotal moment for Rueck as he was trying to build a national-caliber program. "When Mikayla told us she was coming, it was one of the most emotional commitments I've had, because I knew what it meant," Rueck says. "There was a bar that was set by Ruth and Jamie Weisner and Deven Hunter and Sam Siegner — the ones who first jumped on board — and then Sydney Wiese and Gaby Hanson came. "When Mikayla committed to Oregon State that night on the phone, I knew we were going to be able to sustain the culture and add on to what had already been built. She would continue what Marie Gulich and all the others had established. 'Mik' is one of those special ones who keeps the bar very high.' "
Pivec's college basketball career has been close to straight A's, too. Playing at small forward, she was the only freshman starter in 2016-17, when the Beavers went 31-5, won the Pac-12 championship and reached the Sweet Sixteen. She averaged 7.5 points, 5.0 rebounds and 1.9 assists. The 5-10 Pivec was the second-best player (behind All-America center Gulich) as a sophomore last season, averaging 11.1 points, 7.1 rebounds and 5.0 assists on an OSU team that finished 26-8 and knocked off Tennessee and Baylor in the NCAA Tournament on its way to the Elite Eight. Pivec switched to point guard with the graduation of Wiese, and her leadership was integral to Oregon State's success. Moved to shooting guard this season, Pivec is the Beavers' best all-around player. She ranks second on the team in scoring (14.8) and assists (3.4) while leading in rebounds (8.9, ranking her fifth in the Pac-12). Pivec also is shooting superbly; she ranks third in the Pac-12 in field-goal percentage (.555) and is shooting .487 from 3-point range, which would rank first in the conference if she had enough attempts. And, Rueck uses Pivec to defend an opponent's best player at every position except center. This season, the Beavers are 19-3 overall, 9-1 in Pac-12 action and ranked seventh in the nation. During her career at OSU, Pivec is 76-14 overall, 39-5 in conference play and 42-7 at Gill Coliseum. Don't undersell her value in all of that. "After the USC game, I said to (radio play-by-play announcer) Ron Callan, 'Mikayla is maybe the most impactful player in the country that not enough people are talking about,'" Rueck says. "She impacts the game in so many ways. There are very few players who do it the way she does it. "There is the impact she has on her teammates — emotionally and competitively — and then to impact the game in the open court, in the half-court, offensively, defensively ... and then she has the desire and the ability to will her team to a win." Pivec displayed that in a 79-76 home loss to Arizona State in overtime in which she had 19 points, nine rebounds and seven assists on a day when none of her teammates could get anything going offensively. "She had not one turnover in her 47 minutes, and hers were the biggest baskets in the game for us," Rueck says. "She kept us in that game almost single-handedly, grabbing offensive rebounds, scoring, creating opportunities." Pivec's biggest drawback may be that she is too unselfish, sometimes turning down shots for a team that needs her to score, especially with the season-ending injury to the team's best 3-point threat, Kat Tudor. "Losing Marie left a big void in rebounding and offensive production," Pivec says. "Kat's loss is another hole to fill. She created so much space on the floor for the rest of us. I know the team needs my offense. I'm trying to look more to score." Senior forward Katie McWilliams calls Pivec "the best teammate you could ask for." "Mikayla is someone who is going to be the hardest worker out there," McWilliams says. "She makes all the hustle plays. She's not the most vocal leader, but she leads by example. She always knows what to do. She does things the right way. She is someone you can look up to." Pivec is a good teammate almost to a fault. "'Mik' would rather her teammates have success than she have success," Rueck says. "She is one of those people who works so hard and does everything to help other people achieve. "She is like that in our locker room. She just takes care of everybody. She is here to make everybody's life better. Just watch her for a minute and you see that selflessness every day." Pivec believes she has benefitted under Rueck's tutelage. "It's been so great for development as a person and a player," she says. "He is able to communicate really well with me in terms of what I need to do better and what to look for on the court. How he sees the game, how he thinks about it, has helped me play better." Pivec and McWilliams rent a five-bedroom house close to campus along with three other OSU students, including Tudor and center Joanna Grymek. "It's been really good," says McWilliams, a South Salem High grad. "I was hesitant to live with so many girls, because I like my space. But it's been great getting to know everyone on a more personal level." McWilliams also is an outstanding student. She carries a 3.79 GPA in kinesiology and was named to the Pac-12 All-Academic second team a year ago. McWilliams is interested in a career in physical therapy. Asked to describe Pivec, McWilliams says, "There are a lot of words to describe her, and they're all positive." "Selfless," she says. "Nice. Easy to talk to. She is someone who really cares about what you have to say and wants to listen. She has a quiet sense of humor. She is overall a very kind person, the kind you always want to be around." Pivec is also a doer. She is a member of the student-athlete advisor committee at OSU and serves as chair to coordinate community service activities. Last fall, she and teammate Destiny Slocum started a club called "Beavs CARE (Corvallis Athletes Reaching Everyone)". The first project involved 20 club members making cookies to distribute at homeless shelters in the Corvallis area. There are also basketball team activities to attend at times. Last week, Tudor's parents hosted a Mexican food cookout for the team prior to their daughter's surgery for an ACL injury. "We try to do those kind of things as much as possible," Pivec says. "During the season, there's a little less time, but it's super fun, and it's important for team chemistry. "If you enjoy the people you're around, you'll perform to your maximum potential more often than not." Even with what seems to be an array of constant activity, Pivec says she has been able to average "probably eight or nine hours" of sleep so far this term. "No 8 a.m. classes, and that's helped," she says. "I'm not taking as many credits, and that's helped, too." How does she find the time to do everything, and do it so well? "It's a blessing to play basketball at this level," Pivec says. "It's a big commitment, but it's an awesome opportunity to get a college education paid for and play at the highest level possible. You have to find your priorities and decide how much time you can commit to each activity. Sometimes it means less Netflix, if that's what it takes." Pivec is going to get an opportunity to play professional basketball. After that, she'll be on to a second career. "I don't know how the timeline will be," she says. "Basketball isn't going to last forever, but the plan is whenever my basketball career ends, I'll go to medical school. "But I'd love to play basketball as long as possible. Getting paid to play a game would be cool."